A Chinese Long March rocket lifted off from the Xichang Satellite Launch Center in southwest China, delivering a navigation satellite into space. The Long March 3A rocket launched at 5:44 a.m. local time on July 27, 2011. 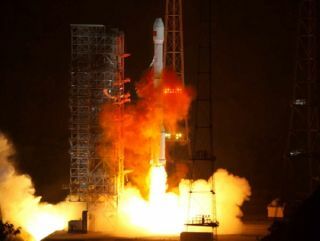 A Chinese communications satellite, potentially designed to relay messages between Chinese military forces, blasted off on a Long March rocket Sunday. The Chinasat 1A spacecraft launched at 1633 GMT (12:33 p.m. EDT) Sunday from the Xichang space base in southwestern China's Sichuan province. It was 12:33 a.m. local time at the launch site. China didn't announce the launch in advance, but state media reported after the flight that the payload will provide "high-quality voice communication, broadcast and data transmission services for users across China," according to the Xinhua news agency. Western analysts believe Chinasat 1A will serve the Chinese military. Xinhua reported the spacecraft was manufactured by the China Aerospace Science and Technology Corp. The satellite could be based on the DFH-4 spacecraft bus, China's most powerful standardized platform for communications missions. Sunday's blastoff was the first Chinese space launch since the Aug. 18 failure of a different version of the Long March rocket. It was the 10th space launch attempt by China this year, and nine of those missions have been successful.